It's always interesting to me when I feel the need to google a book as soon as I've finished it. I'm never quite sure if that compulsion is coming from a place of inspiration and hunger to know more or frustration and confusion because I didn't really understand what I was reading. Often times all of those feelings are rolled into conflicting thoughts and opinions in my head. This time I'm pretty sure it was coming from the latter. Preface: I'm not a "deep" reader. I never enjoyed conversations about symbolism in English class. This isn't to say that I can't participate in those types of discussions, but I find my comfort zone is on the surface of the book. Tell me a story, and if you're telling it right, I'll get everything you're trying to say. 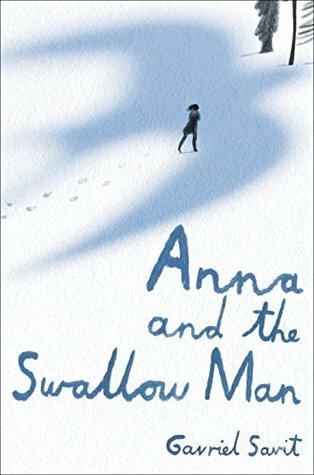 At the end of Anna and the Swallow Man, I couldn't say that. Instead I found myself saying "Gavriel Savit, I know you're trying to tell me something - and something tells me it's something profound and thoughtful - but I'm just not getting it." Hence the googling, where I thankfully found this very interesting article by Elizabeth Wein and the muddy got cleared up a bit in a discussion on allegory and metaphor. Anna is a young girl living in Krakow who finds herself orphaned after her father is arrested and sent to a concentration camp. In her wanderings around the city unsure what to do, she meets a man that she refers to as the Swallow Man. Together they flee the city and survive in the wilderness away from the "wolves". Isolated and lonely, Anna discovers that the world is a dangerous place but there is always hope. Another preface - in all fairness I picked up this book without knowing much about it other than the audiobook version had been selected for the 2017 Odyssey Award. It has been a few weeks since I've finished, but I'm still having a difficult time deciding whether or not I liked the book. It's shelved in teens, but I can't help feeling like this would be a very hard sell, even to my readers who really enjoy historical fiction set in WWII. The truth is, there wasn't a whole lot of plot (which maybe goes hand in hand with the allegorical set up). Sometimes that not a bad thing, but when the development lingers just on the edge of actually getting to really know any of the characters, the lack of plot leaves you wanting more. On the other hand, I found myself drawn to Anna and her struggles. Despite the horrors she has seen and the heartbreak she has endured, she's willing and able to open her heart to others. As for the Swallow Man - well, I suppose he'll just have to remain mysterious to me.